As I have written before the Milo of Croton story which seems to resonate in the fine arts is the story of Milo’s death wherein Milo attempts to rend a tree in half, but is not strong enough. He ends up caught within the tree and devoured by wolves. Not a pretty story, but it has made for some pretty pictures. The other, more inspiring story of Milo, wherein he trains by lifting a calf onto his shouldersday after day until it becomes a bull is not nearly as well represented in the arts. In the modern era, this story lives on mainly through the bodybuilding and strong man underground. Google “milo and the calf” and you’ll soon end up on a message board where dudes are talking about getting swole. Me, I’m not interested in getting big. In fact, for my sporting needs it is all about getting small. But that doesn’t mean I’m not still fascinated by strong man culture, especially in its early incarnations. The early days of strength training share a lot in common with the early days of modern distance running – athletes with little or no access to scientific studies experimented with their bodies, figuring out what worked, and what didn’t. Systematizing what it meant to be strong or “well developed” was a very hit of miss endeavor. Eugene Sandow lead the way at the turn of the century by attempting to model his physique on that of Greek statutes. Others followed, creating the kettlebell, the barbell and, eventually, modern strength training. This is Robert Edward “H.E.” Mann, a strong man who lived in Tennessee. 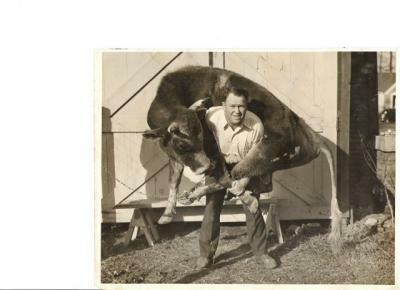 According to relatives, he trained for this feat just like Milo, picking up this bull every day since it was a calf. There are those out there who do not buy this – they think the photo is doctored. I don’t know, looks real enough to me. Besides, like the image of Bill Rodgers running in circles around the same pond in a Boston suburb day after day, year after year, the idea of a guy somewhere in Tennessee in the 1950’s picking up a cow everyday just warms my heart.